Mommy This &That: We've got furniture! The baby's furniture is in...it just has to be driven from NC to GA, so it will still be a little while before we have it and can set it up in his room. Which is good, cause the room still isn't ready, but Hubby is working like a fiend to get a portion of the basement ready, so I can move my office and we can start the nursery. Apparently we love the stress of it all and don't most people work better when they have deadlines breathing down their necks? We are pairing that with a khaki wall above the border and a navy wall below, add furniture and voila, the nursery is done. I am anxious to see the final product and will surely post before, during and after pictures. These just scream little boy and Daddy's little buddy, don't they? I know the first month is going to be hard and everyone has said I will want the baby as close to me as possible, so I figured this was a good buy. I opted against a bassinet only because they outgrow them so fast. 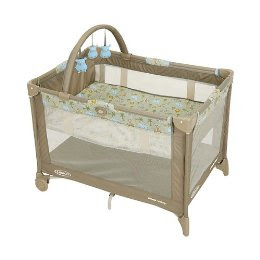 I can use this pack&play as his bassinet while he is newborn and he can use it beyond. I think I had orginally registered for some fancy-schmancy one at BabiesRUs, but realized we didn't need bells and whistles. Sadly the dog's bed was moved to put this in our bedroom beside me. I was worried Prince would retaliate, but he didn't. We moved his dogbed and he went to where it was (still in our bedroom) and crawled in! We are lucky to have such an accommodating dog. That's all I got for now...21 days and counting! VERY nice!! I love the border - good choice for a growing boy!! I love the border! The room is going to look GREAT! I can't wait to see the finished product! Love your choices for the nursery... it's ALL BOY!! And yes, you will definitely be more happy and at peace with Baby Boy close to you at night. And how are you NOT totally freaking out that the nursery isn't done yet? Kudos to you... I would've lost my mind already. Wow...you're journey is almost over, with an even longer one yet to come. Love the way you're outfitting the baby's room! The time is almost here.. The room is going to look so good! The color scheme is wonderful for a little boy! I hope you get pictures up when it's finished so we can see your handiwork! BTW, Uncle Lynn decided to join the Bloggy Giveaway Carnival this week, so we're having an impromptu Pop'rs Giveaway this week! HI stalked over to check on the MOM to BE! Just wanted you to know that you are in my thoughts!